THE best festival in our culture. It’s more fun for kids -thanks to endless fireworks & new dresses they get to wear. And not to forget the Indian sweet delicacies. It’s the festival of lights and one of the most imporant too! 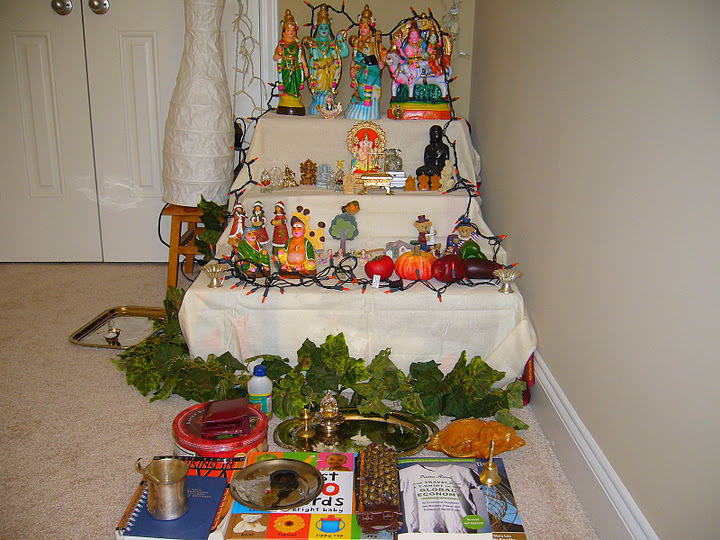 It is celebrated all over India to signify the triumph of good over evil. That time of the year! 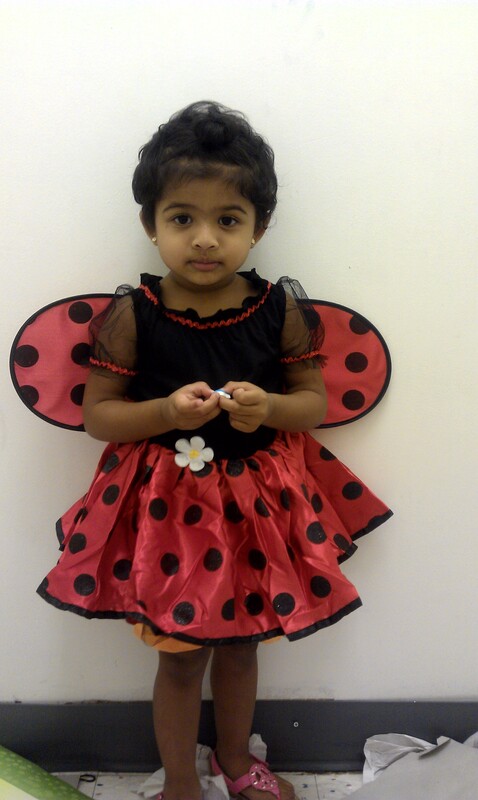 And I’m pretty sure, lady bug is the MOST COMMON costume for Infant-Toddler girls. 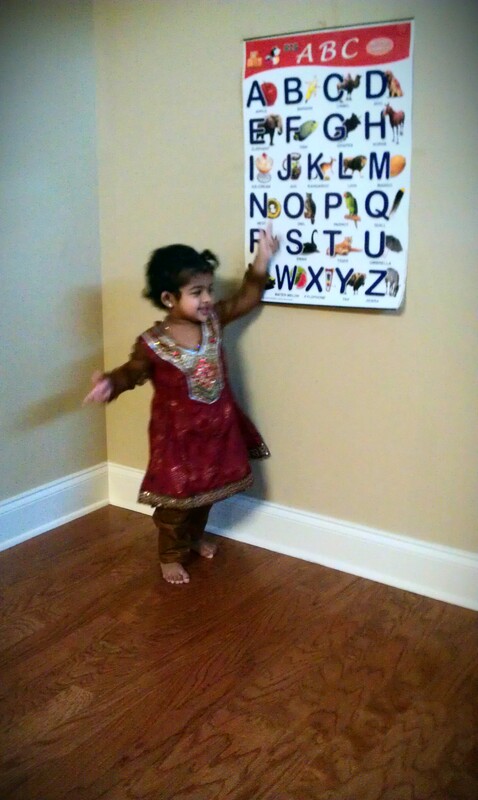 And Shriyu still wears 2 yr old size and this costume was perfect in size for her. When I realised Shriyu is doing well by sleeping in her own room, own bed…Sigh – She’s back 😦 How much ever I try to blame it on her cold / cough, we still are responsible for this. We should’ve been more cold hearted for her cries…We gave in, and before we realise, she’s in our room. But thank god, she sleeps in the Floor mattress but the 3AM nudge still continues. She used all her strategies, trying to throw up, continuous cry, knocking on the door…and she won! Watching my 2 year old play with her dolls – is my favorite activity. The weekends when we both are in the living room, after breakfast, me engrossed in my laptop, Georgie playing in the Television, I often take a peek off from my screen and watch her. She will pull her chair towards the choo-choo train-building blocks – pretends it to be a cake, pulls out my car key from the shelf – pretends it to be a knife, starts to cut the cake and sing ‘Haappp bud-daayyy Achooo’ (Achoo – her fav Purple doll). She runs towards me with the cake (block) in hand and in a loving tone, says, ‘eat,amma’. She would’ve got one for her too in her other hand and we both ‘pretend’ to eat it…Simple Pleasures! Other days, she will keep Achoo in her baby-stroller and waves bye-bye to me, ‘pretends’ to take achoo for a stroll, comes back home and yells ‘Haiiiii Amma’…Simple Pleasures! Toddler tantrums gets on your nerve at times…and I really mean it! I dont know who named this stage as a Terrible-Two, but it gets really terrible. Shriya is no exception. Giving her a time-out or not talking to her or ignoring her – while she throws a tantrum – works! These days, I just let her cry it out and I won’t try to stop it. I can very well tell when she’s faking it or when she really means it. Asking for more candy, wanting to play with neighbor kids more, not letting us change from her Curious George time – these are all her “frequent” tantrums…Those times I just tell myself, these shall pass too! Am always a big fan of Elizabeth Pantley’s books. Whenever I read her book, I feel like nodding my head at most of the places & agree to what she writes. Her No cry Potty solution book, though I relate to it much, I still am unable to potty train my daughter. Accidents do happen & I find very less time between dinner-next day’s lunch-preparation & running her to Potty. Even If I find time & make her sit in it, she doesn’t do her job there n says ‘Am done’ and runs off to play with her stuffs. 😦 Sigh! 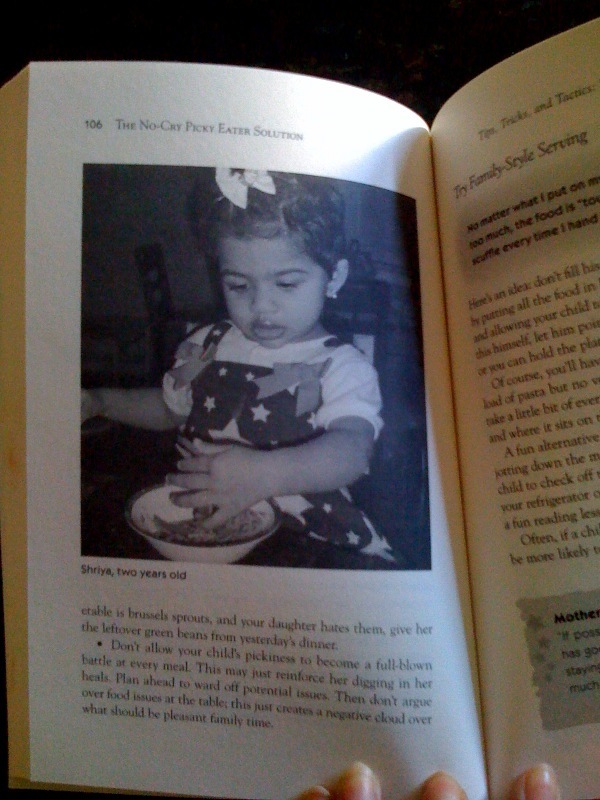 Few months back, she called for pictures for her upcoming – No cry Picky eater solution book. And I sent Shriya’s photo. Though it was very difficult to get a good one, I finally succeeded in it & sent her one. And 3 weeks back I learnt that her picture got a place in her book & needless to say me & my DH were thrilled & excited & overjoyed!!! Ahhh it’s that time of the year! The colorfull dolls, pile of boxes to arrange in staircase-step pattern, dressing up, having friends over, laughter, food and the thaamboolam-vethalai-paaku bags! Every year, I look forward to buy new dolls, imagine the golu-padi in my mind, visualize it as how it’s going to be formed…So much tradition involved in this. 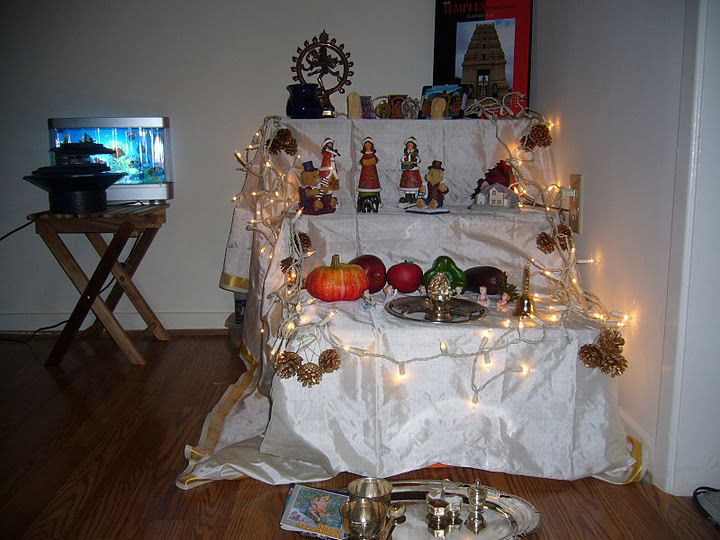 Ever since I came to US of A, 5+ years back, I have kept Golu at my place every year, almost. The one time I missed it was during 2008 when I was badly down with my nausea, morning sickness. thanks to my Pregnancy hormones! And from 2009, I had all reasons to continue Golu tradition, for my daughter, princess – Shriya! But this year, she’s much more grown up, beautiful Toddler & above all, she can understand when I say ‘ummachi bommai, don’t touch it, Shriya’ She respects my words & obeys me, does namaskaram to Golu along with me, wants to keep kumkumam on her forehead when I keep mine 🙂 So cute! 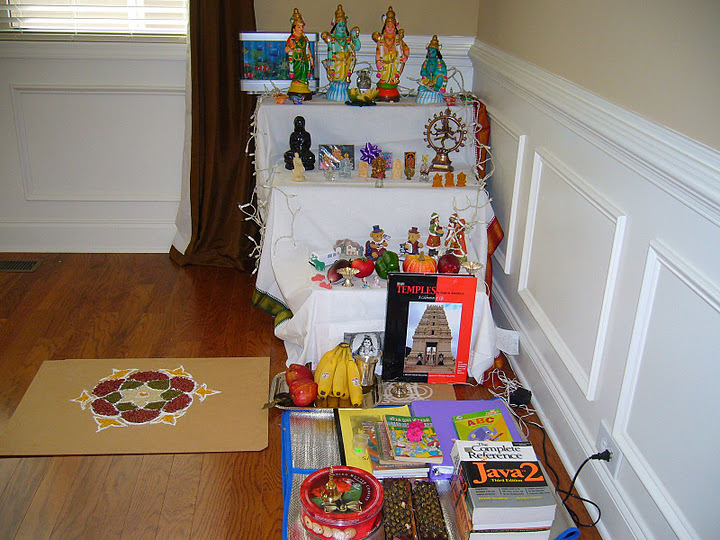 This year: My new doll added to the collection is my most fav: perumAl & thAyAr set. As always, I have planned for guests, friends to come over to our place for vethalai-paaku this weekend. It’s going to be a huge crowd, and we are expecting 40 adults & 10 kids. The more the merrier 🙂 & we love to have them all together at our place!!! 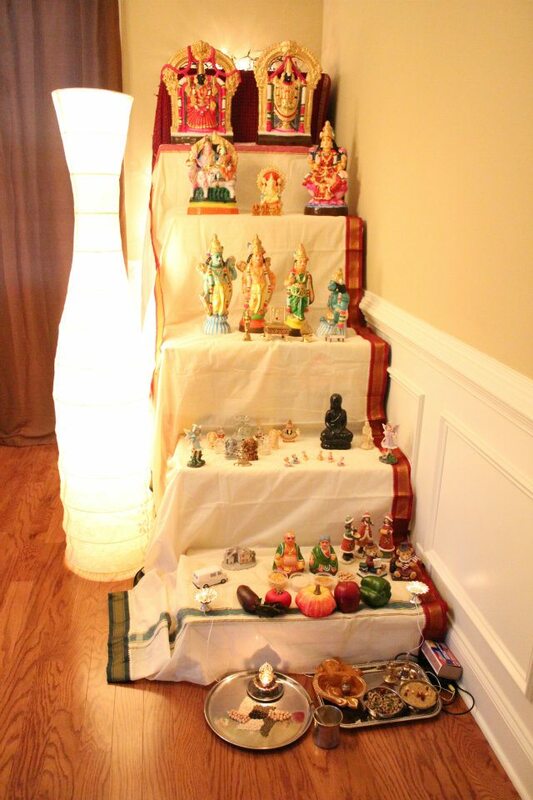 Here’s some pictures of our previous year’s Golu!